This information relates to the Republic of Congo (also known as Congo-Brazzaville), rather than the Democratic Republic of Congo (DRC). The main point of entry is the capital, Brazzaville, a thriving city on the banks of the Congo River opposite Kinshasha, the larger capital of the DRC. Brazzaville was founded in 1880 and was subsequently the first capital of French Congo, prior to Congo gaining independence in 1960. There are some notable buildings including the Basilica Sainte-Anne of the Congo constructed in 1949 and considered one of the most beautiful of modern churches, the presidential palace and Sacre-Coeur cathedral. Poto Poto market is a large, lively affair where locals shop for food and clothes and there are stalls selling crafts and artwork. 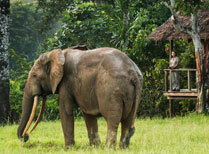 Most visitors come to Congo for its largely undiscovered nature and wildlife. A handful of national parks showcase the country’s diverse habitats and animals. These include Conkouati-Douli with areas of both mountains and coast, Nouabale-Ndoki with vast lowland forests, and Odzala-Kokoua, one of Africa’s longest established national parks and includes forests, rivers and bais, swampy areas where you can often observe mammals. Congo’s parks have populations of western lowland gorillas, chimpanzees, monkeys, forest elephants, buffalos and bongos. 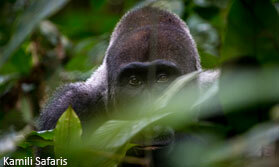 Tracking primates through the forest is an amazing experience that is sure to leave a lasting impression. Explore remote Congo rainforest, with western lowland gorillas and forest elephants and other wildlife in forests and 'bais' (forest clearings). 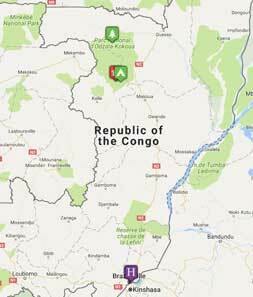 Below you'll find some of our very favourite places to stay in Congo. However you can also see our full directory of properties by clicking the "All Places to Stay" button. 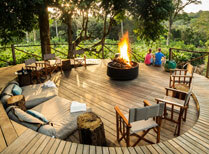 Lango Camp is on the edge of the savannah and has access to the Lekoli and Mambili Rivers and Lango Bai. An attractive, comfortable camp from which you can explore the varied terrain and wildlife of Odzala National Park. 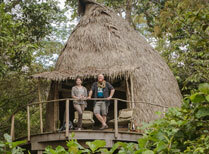 A small 6-room camp in a prime rainforest setting, perfectly located for tracking lowland gorillas. We know and love Congo, and would be delighted to help you plan your perfect trip here. Start planning your tailor-made holiday to Congo. Tell us what you want, and we will tailor make your perfect trip.  Flight time: Flight time is approximately 8 hours. There are currently no direct flights from the UK.  Language: Congo: French, Lingala & Kituba.  Visas: Visas are required for British nationals and must be obtained in advance as they are not available on arrival.  Health: Yellow Fever vaccination is compulsory and must be obtained at least 10 days in advance of travel. Malaria prophylactics are essential for all regions and all year round. No other vaccinations are compulsory.